Global attempts by Dow AgroSciences to gain approval for new genetically-modified soybean varieties resistant to the herbicide 2,4-D have become particularly aggressive in recent months. Simultaneous applications have been filed in several of the countries where genetically engineered crops (GE or transgenic crops or GMOs) were introduced in the 1990s. The push for approval of new transgenics is part of a broader strategy by agribusiness to make the world’s farms increasingly dependent on its toxic herbicides, thus increasing the profits it derives from selling these chemicals. The current situation is a rerun of the 1990s’ introduction of Roundup Ready (glyphosate-resistant) crops, only this time the herbicides in question are much more toxic. These weed-killers have been around for a longer time and the case for their hazards to human health and the environment has been well documented. The public pretext for these new GE crops is that they are necessary to counter the rapid spread of glyphosate-resistant weeds, popularly known as “superweeds.” But superweeds only exist because they have adapted to survive repeated sprayings of Roundup! In other words, they are a serious problem caused by a technology that was designed as a solution to a lesser problem (offering farmers a convenient way to kill weeds without killing the crop). Only 18 years after their introduction, Roundup Ready seeds are an utter failure. Applications are now before the regulatory agencies of the United States, Argentina, Brazil, and South Africa for approval of a new genetically engineered soybean resistant to 2,4-D. The four countries are moving in parallel towards the granting of commercial growing permits. This dynamic shows how these corporations operate on a global scale with the confidence that they can have their way with our public institutions – which have been colonised, they know full well, by corporate power and ideology. The good news is that peoples’ movements and peasants’ organisations have stepped up their resistance, actively mobilising and raising their voices in public forums to fend off this new attack. The Dow Chemical Company is an American multinational corporation founded in 1897. Initially a chemical manufacturer, in 1989 Dow embarked on an agrichemical joint venture with Eli Lilly, the pharmaceutical giant. Eight years later, the resulting company was bought by Dow and renamed Dow AgroSciences. It markets 2,4-D as a single herbicide under the Frontline trademark, as well as in herbicide mixtures under a wide variety of other brand names. 2,4-D is the standard abbreviation for the chemical 2,4-dichlorophenoxyacetic acid. A synthetic auxin, or plant hormone, used to kill broad-leaved weeds, it is very commonly applied in combination with other herbicides. It was developed in England during the Second World War and was first marketed in 1946. 2,4-D is notorious for having been an ingredient in Agent Orange (along with 2,4,5-T), the chemical used as a weapon by the United States in the Vietnam War. The health harms caused to thousands of people by Agent Orange were mainly due to the presence of a carcinogenic and teratogenic contaminant (a dioxin) in the 2,4,5-T component. However, some of today’s 2,4-D preparations are likewise contaminated with dioxins due to the way they are manufactured.Numerous studies have shown 2,4-D to be highly toxic, even though it is classified as moderately hazardous (Class II). 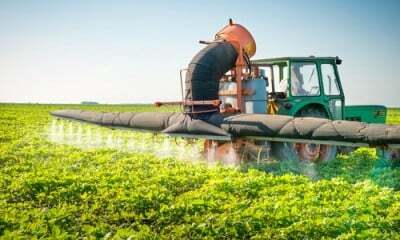 It is linked to a rise in non-Hodgkin’s lymphoma cases among farmers and pesticide applicators in the United States.2 For this reason, it was the subject of a controversial 17-year review process that culminated in June 2005 when economic interests prevailed over doubts about the product and EPA decided to reregister 2,4-D.In terms of its mode of action, 2,4-D is a synthetic hormone and has been shown to function as an endocrine disrupter in the human body.32,4-D is also a neurotoxin. It is readily absorbed through the skin or by inhalation and can damage the liver, kidneys, muscles, and brain tissue. Oral consumption of larger quantities (100–300 mg/kg of body weight in mammals) and absorption through the skin can be fatal. Exposure to the ester and salt forms of 2,4-D is linked to a wide range of adverse human and animal health effects including embryotoxicity, teratogenicity, and neurotoxicity.2If all this is not bad enough, commercial 2,4-D formulations contain highly toxic adjuvants (other chemicals which enhance the herbicide’s effectiveness). The world’s 18-year experiment (1996–2013) with Roundup Ready soy offers clear lessons regarding the potential risks of the new 2,4-D-resistant seed. The figures for Argentina indicate that Roundup use increased by approximately 220 million litres during this period.4 For the United States, Benbrook6 reports an increase of 239 million kg during the period 1996–2011. Given this data, there can be no doubt that the approval of any 2,4-D-resistant transgenic event will cause an exponential rise in the use of the herbicide. And soybeans are not the only crop concerned: applications for approval of 2,4-D resistant cotton and corn varieties are also under review. These varieties include stacked resistance to other herbicides (glyphosate and glufosinate), making the projected increase in overall herbicide use that much greater. The following is an overview of the status of 2,4-D-resistant soy applications filed by Dow in various countries. Dow is seeking approval for a 2,4-D-resistant soybean (event DAS-68416-4) in addition to other stacked herbicide-resistant events (glyphosate and glufosinate ammonium). The Center for Food Safety has launched a petition7 calling on the US Department of Agriculture (USDA) to reject “Agent Orange” soy and has already gathered 32,000 signatures. More recently, it denounced an application for 2,4-D-resistant corn and cotton events. It is worth noting that soy, corn, and cotton are practically the only crops with which the corporations have achieved any commercial success. Peasant organisations, NGOs, environmental groups, and environmental law groups have sharply criticised CONABIA’s stated rationale for the decision. So far, the campaign has delivered more than 2,000 signatures to the president. Simultaneously, the Argentine environmental law group CELMA made a presentation to the federal Department of Agriculture, Livestock Production and Fisheries9 challenging the CONABIA decision document. CELMA asked that the environmental and food safety studies submitted by Dow AgroSciences Argentina S.A. be made available for public scrutiny, that a public hearing be held, and that the Department of the Environment and Sustainable Development be required to play its statutory role in the decision. No response has yet been received to any of these actions. The critics contend that this approval will lend support to Dow’s applications for release of this variety in Brazil, Argentina, the United States and elsewhere. -The first conclusion to be drawn is an obvious one: that the technology package consisting of using herbicide-resistant seeds in no-till cropping systems has been an abject failure.13 Everybody now agrees that herbicide-resistant weeds have become a major problem, yet, during the first GE decade, the corporations routinely denied their existence. Roundup Ready crops have quite simply betrayed the promise that their use would result in reduced application of herbicides. -More specifically, this situation constitutes conclusive proof of the total failure of what has been far and away the most commercially successful genetically engineered trait: glyphosate resistance. Roundup Ready soy is the most widely grown transgenic crop, covering an area of over 100 million hectares worldwide. We can now say with confidence that it could not have colonised our fields to such an extent without lies, corporate machinations, and shameful complicity on the part of our governments and scientists. – These new transgenics will translate into the application of millions of litres of herbicides even more toxic than glyphosate. Their appearance confirms that a war is being waged against peasants who continue to resist the incursions of agribusiness into their homelands. But this time the scale of the assault is reaching new levels of intensity. – The five countries mentioned are among the world’s chief GE soy producers, with a combined total of over 80 million hectares under cultivation. Roundup Ready soy is a commodity crop intended mainly for animal feed and agrofuels; it makes little or no contribution to human nutrition. The new herbicide-resistant crops will only exacerbate this situation and worsen the coming food crises. – The world’s regulatory agencies continue to act as rubber stamps for the technologies landing on their desks. They have been captured by the very corporate interests they are supposed to regulate and continue to base their decisions on insupportable concepts such as “substantial equivalence.” The various “biosafety” instruments that have been adopted are just the institutionalisation of these corporate interests, while public participation (where it exists) is a pro forma façade. – Sustained resistance is growing in every country as the impacts of transgenic technologies are denounced and the fallacies that allowed for them to be rolled out are exposed. An ever-broadening range of sectors are raising their voices against GMOs. – Ultimately, to study the history of how GMOs were forced upon us is to discover that we have come down the wrong road. The task now is for us to make the failure of this technology universally known, dismantle the corporate power that keeps it afloat, and embark on the road to food sovereignty, striding along with the small farmers who do the real job of feeding the world. 1 International Service for the Acquisition of Agri-biotech Applications: DAS44406-6, DAS68416-4, DAS68416-4 x MON89788, and DAS81419. 4 GRAIN, “The United Republic of Soybeans – Take Two,” 12 June 2013. 6 Charles Benbrook, Impacts of Genetically Engineered Crops on Pesticide Use in the U.S.: The First Sixteen Years, 28 September 2012. 8 Biodiversidad en América Latina y el Caribe, “ACCIÓN URGENTE: Argentina a punto de aprobar nuevo transgénico resistente al 2,4D uno de los componentes de Agente Naranja,”, 10 October 2014. 9 CELMA, “Nuevo dictamen favorable de la CONABIA sobre soja tolerante al 2,4-D, glufosinato y glifosato de DowAgrosciences Argentina SA: impugnación del CELMA”, Biodiversidad, 4 January 2014. 10 RENACE et al, Conferencia de prensa: “¡No a la soja resistente al 2,4 D!”, Biodiversidad, 12 February 2014. 11 AS-PTA, “Brasil: MPF debate liberação de soja e milho resistentes a 2,4-D,” Biodiversidad en América Latina y el Caribe, 18 December 2013. 12 African Centre for Biodiversity et al, “Duras criticas al gobierno sudafricano por la aprobacion de la soja transgenica agente naranja“, Biodiversidad, 26 March 2013. 13 Direct seeding, conservation tillage, and no-till agriculture are synonyms for a cropping technique in which the soil is not plowed. Initially proposed as a soil conservation practice, it was commandeered for the implementation of herbicide-resistant crops. 14 GRAIN, “Más herbicidas para sostener lo insostenible“, 18 September 2007.